Like many great stories, this one begins with two people meeting, falling in love and deciding to spend the rest of their lives together. After serving in the South Pacific as a marine in WWII, Sherm Olsrud settled in Eugene, Oregon -- quite a change from his home state of North Dakota. Not long after that he met Wanda who was working in a restaurant operated by Sherm's Aunt and Uncle. It didn't take long for the two of them to figure out a future together sounded pretty good, so they were married in 1947 and set about making a life together. About 10 years later, they bought Wilson's Sausage Kitchen on the corner of Hwy 99 W. and Roosevelt Boulevard in Eugene, Oregon and set about recreating it in their image. By 1961 their hard work, long hours and innovative thinking paid off when they moved into a brand new 10,000 square foot building and opened a full-fledged grocery store with four checkstands they called Sherm's 24 Hour Market. They figured the night stockers could check-out customers as well. "I gave it a lot of thought," says Sherm, "Being the first 24-hour store there, we created our own niche." Wanda ran the office and Sherm handled the meat counter. They operated the store along with partner Floyd Hodges, until they bought him out a few years later. By the time the mid-1960's came around they were ready to grow, but didn't have the resources to finance an entirely new operation. "We couldn't expand the store, because there wasn't any more room and Sherm always wanted the store to grow," Wanda Olsrud says. That's when fate stepped in one more time and in 1967 they were presented with the opportunity to purchase the six year old Thunderbird Market in Medford, Oregon. "I'd rather not say what we bid," Sherm says, "But it was real, real cheap." "We couldn't afford a new sign so we kept the name," Wanda recalls. "We added Sherm's to it because we didn't want to be stuck with other people's bills." The Olsruds both worked 15 to 16 hours a day, seven days a week to make sure the new store was a success. They were also helped by their son Steve, who had been a courtesy clerk and box boy in his parents store in Eugene. Steve started out as a checker -- eventually working his way up to store manager before taking on even bigger responsibilities in the family business. The company became a "chain" when the Olsruds expanded into Klamath Falls, Oregon, by purchasing the Mayfair Market in the Shasta Shopping Center in January 1974. In 2006 they built a brand-new store across the parking lot after the original building started feeling a little cramped. In November 1977, Sherm and Wanda acquired the old Bazaar department store on Biddle Road in Medford, Oregon. 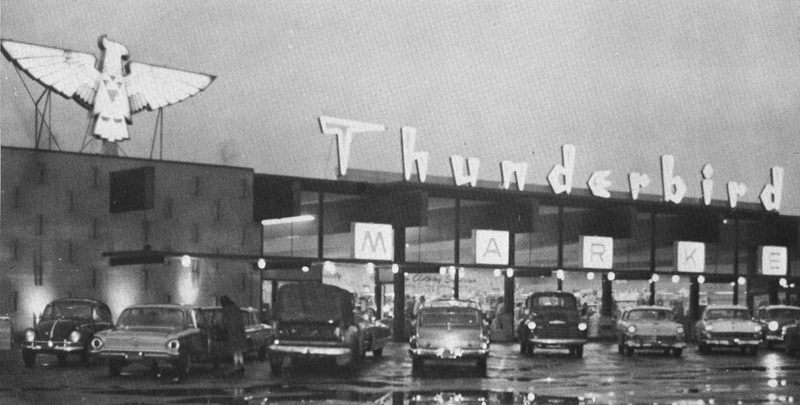 They renamed it Sherm's Thunderbird and operated it as a one-stop shopping center until 1985. When the Olsruds obtained a Food 4 Less franchise, they converted it into a 24-hour warehouse grocery store in July 1985. Their fourth location was added in April 2000 when the company purchased the struggling Food World in Roseburg, Oregon. Keeping much of the original staff and converting it to a 24-hour warehouse style operation enabled them to quickly turn the store around. 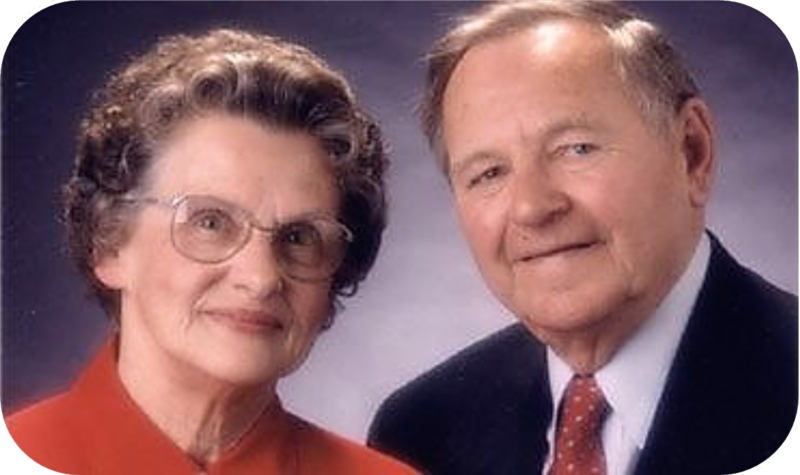 The Olsruds take care of the basics, go by the book and stay astride of industry changes. They were a pioneer in the 24-hour market in Eugene and were the first grocers in the Rogue Valley to adopt bar-code scanners. "On an every-day basis, things are changing all the time," Sherm says. "We go to seminars, buying shows and lectures. It's a changing world and you've got to keep your eyes and ears open." But technology alone doesn't create the kind of customer loyalty the Sherm's stores see. The Olsrud's original commitment to customer service, good value and large selection are still practiced daily throughout the company. "The customer is still the boss," says Sherm, "always has been and always will be because the customer has a lot of options." The Olsruds continue to be active in supporting many local activities in the communities they serve. From youth and high school sports, to donations to local food banks, to funding scholarships the Olsrud family loves sharing the rewards of their success.They are especially enthusiastic about supporting 4-H and FFA programs in Douglas, Jackson, Josephine and Klamath counties. The Olsruds not only donate to those programs but they've become fixtures at local youth livestock auctions over the years - purchasing thousands of animals which are later sold in their stores. The entire Olsrud family wishes to thank the great customers who continue to shop at their stores and the fantastic employees who work so hard to carry on the legacy Sherm and Wanda created.